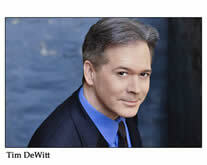 Tim DeWitt attended the Eastman School of music in the early 1990s, where he studied voice and opera. He has performed in a variety of operas from Monteverdi to Britten, and served in various churches as section leader and soloist. Mr. DeWitt performed Handel’s “Messiah” under the direction of Alfred Mann and worked with Zuben Mehta, Robert Shaw, Leonard Bernstein, Mark Elder, Domingo, Levin, The Metropolitan Opera, Los Angeles Opera, San Diego Opera, Seattle Opera, San Francisco Opera, Phoenix Symphony, Rochester Philharmonic & Opera, Opera Orchestra of New York, Los Angeles Master Chorale, nicAngeles Chorale, St. Matthew’s Orchestra and Chorale, and Carnegie Hall. As an actor, he has performed extensively in theatre and in film and TV. His credits in theatre include leads in A Chorus Line, 42nd Street, Funny Girl, Godspell, to name a few. In Los Angeles he was the recipient of “Best Actor in a Musical” award from the Valley Theatre League. In T.V. he has had guest leads in such well-know series as “Arrest and Trial” , “ Norm”, “Days of Our Lives”, and Co-host on “ Who Wants to be a Millionaire?”.